A highly scoring optional known to produce IAS & IFoS toppers. Prepare it with strategic precision in just five months with us. Course available now. Join today. 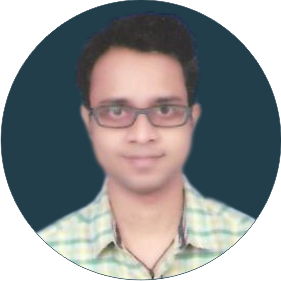 I prepared both my optional subjects with Evolution for the Civil Service and Indian Forest Service Examinations. Despite being a B.Tech. in Computer Science, I mastered subjects like Botany with Forestry with reasonable efforts and felt confident in the exams. The classroom course and notes have been exactly in tune with the needs to the examination. For most of my preparation, I relied only on my class-notes, while the study materials served as excellent reference resources. I was also with Evolution for Interview Guidance and Test Series. I must say that the personal attention – especially from Abhishek Sir – was truly remarkable and went a long way in sharpening my preparedness and keeping myself motivated. Botany has always accounted for about 20% of all selections in the Indian Forest Service Examination and shown a healthy selection percentage of about 10% in the Civil Service Examination. The best part is, you can prepare this subject in just about 5 months with us and you can safely look forward to touch about 60% score or even more. This score is enough to get you in the Top-50 of the final list. Botany being a science subject has a straight and clearly laid out syllabus. It has lately become popular as a safe and scoring optional in the IAS and the IFoS. For scoring well in this subject, you have to know the core facts and concepts with clarity. You also need to know how to present your answer well. During UPSC evaluation, there is always a great degree of objectivity because of the straight forward nature of questions. So, you can be sure of not losing any marks on the grounds that your line of arguments / interpretation did not match with that of the examiner. In sciences, there are only facts and concepts, which if correct, are bound to fetch you high marks. Therefore, with Botany you can be fairly sure of scoring just on the basis your examination hall performance. We have guided many students who have scored more than 60% marks in the IAS Main (a score, which is good enough to make you a top ranker). In the recent years, about 20% of the total selections in the IFoS too have come from this optional. 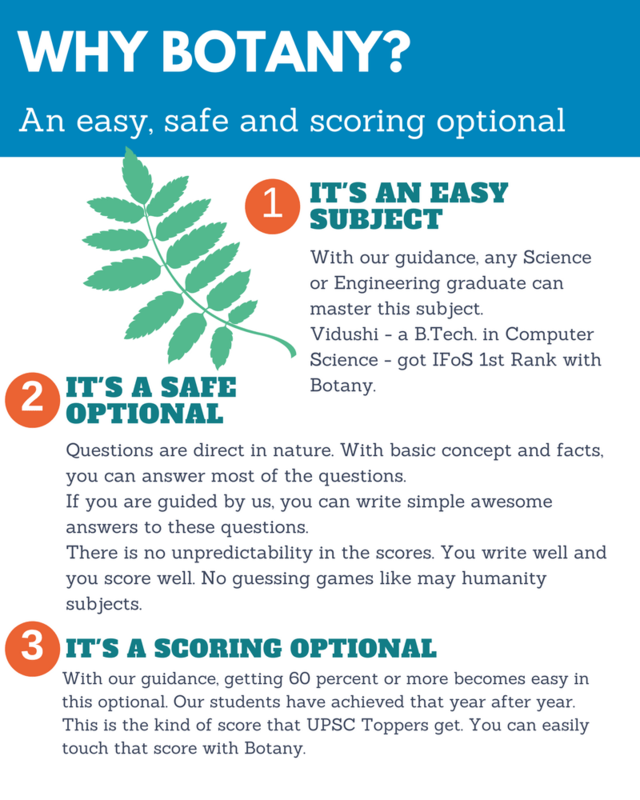 Vidushi secured IFoS Rank 1 (IFoS 2016) with Botany and Forestry optional subjects. 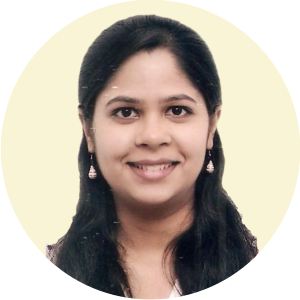 In IAS 2015, our student Divya Jyoti Parida got 26th Rank with this subject. For more results, please visit our results section. Who can benefit from our Botany Course? In clearing the fundamentals of the subject. In the examination paper of Botany; most of the questions are direct and fundamental in nature. Hence, having a clear grasp over the basics is of crucial importance. In adding value to the answer. With us, you will be exposed a number of specialist teachers – each one a master of his / her area. Such teachers dedicate a considerable amount of time in developing updated coverage of various topics they teach. Due to this continuous effort, you get a fast and highly effective value addition to your answers. In organizing the entire course as per the demands of the IFoS / Civil Service Examination. Thus, you can understand the emphasis areas and focus on them appropriately. You can be selective in coverage and maximize the quality of answers in the areas chosen. You learn the intricacies and techniques to write effective and marks-fetching answers, without which much of the preparation may go in vain. If you have been a biological or allied science student, you’ll find the entire course extremely rewarding and easy to manage. Hundreds of such students have already benefitted from our Botany course so far. It is your turn now. This is a comprehensive course for Botany Optional preparation for IAS & IFS Main. With this course you can effectively cover all the vital topics excellently with minimal efforts. It also includes current updates related to the subject and tests. Besides, the course also offers you a clear strategic planning which is crucial to score high in the Main Examination. The course aims to help you score 300+ in IAS Main and 240+ IFS Main in with confidence and with minimal efforts. We have done a meticulous analysis of the last 15 years’ IAS Main question papers and prepared a list of vital areas which must be covered for the IAS & IFS Main. Based on this, we have designed our course. In this course, all vital topics will be covered for giving you maximum output for your targeted input. About 5 Months, which will include the following. How much time I'll have to invest daily? That will include watching our video lectures or video tutorials uploaded for the day plus reading the study materials. What will I get in this course? What type of video lessons will I be getting? There are mainly two formats of video lessons which we are using. This course has both types of video lessons depending on the topic. 1. Teacher’s actual class lectures recorded in the classroom. 2. Narrated animations / presentations. The choice of the video format will obviously be determined by the demands of topic. A total of 2000+ pages of notes are there in this course. All our notes are prepared by our dedicated research team. Needless to add, there will be 100% alignement between our notes and the real demands of the UPSC. Tests constitute an important part of the IAS & IFS Examination preparation. 8 Section-wise Tests. They will be on different sections of the syllabus. 4 Full Syllabus Tests. They will be on the same pattern as the UPSC’s Main Examination. How many video lessons will I be getting? You will get 300+ hours’ video lessons in this course. 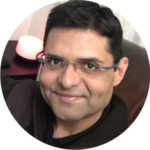 The videos will feature our core faculty including Dr. Abhishek. All the topics requiring explanation will have a video tutorial. Only totally factual topics will not have video lessons associated with them because well written and organised study material will be sufficient for them. How long will I remain enrolled? For the Optional Subject Courses, the enrollment will remain valid for a period of 8 months from the date of signing-up. During this period, you’ll have unrestricted access to all the course materials, videos etc. Even after the expiration of the subscription, you can access the course’s live doubt discussion sessions till your Main Examination. The full syllabus Mock Tests will be held before the Main Examination for which you’ll remain registered till IAS Main Examination 2019. How will I get my video lessons? After you join, you’ll be getting your video lessons on our e-learning platform. Our e-learning platform has been built by a Silicon Valley top-notch e-learning company, which also offers services to Fortune Top-50 companies worldwide. So, when you sign up with us, you get super-easy and smooth e-learning platform that also keenly tracks your progress. How many times can I watch the video lessons during the course? You can watch the video as many times as you want. There is no restriction on the number of times you can play the videos. Can I download the video lessons? There is no download option for the video lessons. However, everything elese is downloadable – for example, all the lecture handouts, all the supplements etc. In 1 minute’s time: You receive the payment confirmation by SMS and e-mail. In 1 day’s time: Your enrollment will activated and you will start taking the course of your choice. I have some other question. Why not? We’ll be happy to address all your quries and concerns. Please drop us a mail at [email protected] or drop a WhatsApp message to +91 9810 975 937. Our team will quickly get in touch with you. I have learnt so much from the way Abhishek sir articulates and presents his thoughts. It used to be absolute pleasure for me to just listen to him. Thank you so much, sir, for your encouragement, guidance and support! Prashant sir and Chiranth sir helped me immensely in covering Forestry in such a little time. Prashant sir was extremely cordial and kind in entertaining my various queries, and guided me throughout the preparation. Abhishek sir, thank you so much for creating such an enabling and friendly environment! E-school for IAS and IFoS is a new initiative from the house of Evolution. Through this platform, we are delivering the same high standards of preparatory support for the IAS & IFoS examinations, which our classroom courses have come to become synonymous with. Evolution’s preparatory support and guidance have resulted into more than 1600 selections in the prestigious IAS & IFoS examinations including 8 All India Toppers. If you are looking for top-notch preparatory support for your IAS and IFoS examinations with the flexibility of being wherever you are and studying whenever you can, our E-school is the just the right place for you. Feel free to join any or all of our online courses based on your needs. If you don’t find a course you are looking for, just drop us a message. We should still be able to help you. Have a query or suggestion? © 2019. Evolution Educare Pvt. Ltd.